Initial storyboard. As you will see, I changed many things compared to the initial plan, but stuck to the fabrics and colours chosen initially. It is very normal for me to keep changing my mind, I'm a Libra :) Well, all kidding apart, I do change my plans often when I sew. To sew well, I need an idea that challenges me and absorbs all my creative energy, transforming me into a little sewing maniac, therefore if I get such an idea, I tend to change my initial plan and give up other "less-inspiring" things. I've also changed the name of my wardrobe to "Fleurs de la Mer" - Flowers of the Sea, because of the flower motive that comes in two skirts and the jacket and because the colours make me think of the sea. 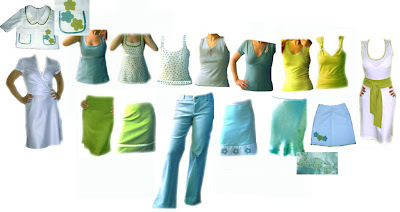 I made 7 tops (four needed for the contest and three extras - top 6 and top 7 do not go very well under the jacket, but at Anne's advice, I post them as extras, therefore they do not have to go with everything, 5 skirts (three needed for the contest and two extras), 1 pant (extra), 2 dresses and 1 jacket (counting as accessory). Skirt 5 - aqua stretch cotton batiste skirt, with hem band and waistband in blue cotton satin and flower appliques. Underlined in self fabric. I really enjoyed this contest, even if I change my mind a lot or get sidetracked, even if at the end I feel a bit bored of the same colours. But it keeps me disciplined and makes me accomplish things. If I would set myself the goal to sew a capsule wardrobe, I will probably get sidetracked a lot more and finish in 1 year. If finishing at all. I've also discovered that I really enjoy writing reviews (maybe that's why my reviews keep getting longer, sorry if I am boring), I like sharing things with potential readers, I like the idea that what I know or discover might me helpful someday to somebody else. I've also made lots of friends here at PR and via my blog and I'm grateful to all the people who encouraged me, offered advice, suggestions and compliments. Not only this feedback is very rewarding, but it also makes me want to get better. And thirdly, it seems I have two fears less after this contest: working with bias, especially sheer fabrics, and sewing jeans. I'll be leaving for the seaside on the 3rd of August and guess what, I'm taking this entire wardrobe with me! I've already worn everything in this little wardrobe and I love and feel great in all the pieces. They do say something about my taste, about my lifestyle, they do say something about me... therefore I'm happy! Just in time, I'm so ready to start sewing for fall. I might do that in a dark grey or black cotton/lycra. And another one in a print? 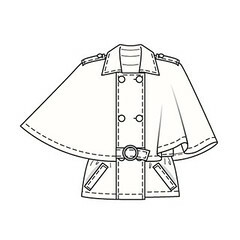 I think I will do this as a jacket and not a rain cape. I'm thinking the silk and linen BW houndstooth from TimmelFabrics. Got to find a black glossy buckle. These pants, in dark grey drapey wool suiting. Maybe a second pair in beige. I adore this. It's so... me. Got to have this. Red or white suiting. Or light grey? Got to find a nice closure for this. Or maybe make one if I can find D-rings. And to go with that, I want a high-waisted pencil skirt, like the picture below. Will use boning. For this jacket, as well as for the cape above, I want to make a pair of long gloves, I found some tutorials and patterns on the Internet (will post the links soon). Don't know if I can find leather anywhere here so maybe I'll order some. Or just make them in a nice stretch velvet. Any suggestions? Pattern from e-sewingpatterns.com, Classic Jeans (it was a free pattern for test. You can download one pattern for free and then, if you want to download a second one, you must comment on your download - if the downloading process was ok, if collating the pattern was ok etc. I commented that I had some problems in assembling the pattern - some columns made out of A4 sheets didn't exactly match other columns and I received good feedback. They told me that I should set my printer for Letter size, even if I print on A4. Haven't tried it yet, but it might indeed solve the problem I had). Instructions? You must be kidding me. Here are the instructions (all of them): "1. Serge edge pieces. Add fusibles or interfacing to respective pieces. 2. Prepare/stitch waistband. 3. Prepare/stitch belt loops. 4. Prepare/stitch back pockets and stitch them at each back piece. 5. Prepare/stitch facing pocket at lining pocket pieces at the each front. 6. Prepare/stitch the minipocket and stitch it at right front. 7. Join/stitch back yoke pieces at each back piece. 8 Stitch back pieces at back center. 9. Stitch zipper at front center and close to crotch. 10. Close/stitch by side edges. 11. Stitch waistband at waistline and stitch belt loops. 12. Close inside legs. 13. Stitch hem. 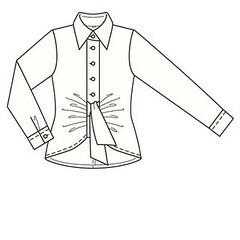 14 Do buttonhole and add button. 15. Do final details and press"
The translation is quite poor of course, but I do not mind that as much as I mind the shortness and ambiguity of instructions. I'm also a bit amazed that they instruct you to stitch the waistband to the pants and add the belt loops before sewing the leg inseams but... whatever. My advice is not to attempt to sew these if you do not have an idea what you should do, because you cannot count on the instructions. Anyway, I did it my way and used again Sandra Betzina's method for a fly-front zipper. Everything was ok. Not a very complicated pattern, just lots of topstitching. The notches were off too but this might be because of me printing on A4 sheets instead of Letter. I wanted to try a classic five-pockets jean, especially after making some jeans for me and discovering I can manage quite well the topstitching (previous attempts at jeans, many years ago, failed exactly because of my topstitching). Very nice and smooth cotton twill, medium weight. Took in the side seams, starting below the yoke with about 1 cm. Took in the back crotch with about 1 cm. Shortened back and front crotch by about 2.5 cm. Also, the pocket bag is far too big, it extends far beyond the front fly, so I've cut out a big part. Shortened the pants with 5 cm (and they say the pants are designed for a 176 cm height. Well, my husband is 178 cm and the pants are faaar too long). They don't say how much the hem allowance is, but I made a 3.5 cm hem. Go here to see how I've modified the pattern - you'll see the actual pattern pieces and the thin black lines are my modifications lines. The extra will be cut away. See here a close-up of the front pants, with three pockets, studs instead of rivets, topstitching etc. See here a close-up of the hem and the double topstiching on the leg inseam. Regarding the waistband, I sewed it using the tutorial made by Kathleen Fasanella - see it here. She designed the tutorial for sewing a cuff to a shirt's sleeve, but believe me, it works wonders for a waistband too! What a unbulky, simple application, I really liked it. Well, after making these changes (not a lot of them and not very painful), the pants fit really nice and I would love to make them again. I love their line and I think that this pattern could be easily adapted to linen for instance, for a pair of nice summer pants (ditching the pockets, yoke and all the topstitching, of course). I must say that I'm really very proud of these pants, my mother told me that it's not nice to brag about yourself, but I really find they are one of the most professional-looking items that I've made. The topstitching looks really good. I used a special jeans needle (size 100), extra strong jeans thread in the needle and regular thread in the bobbin. No twin needle, just two rows of topstitching. My stitch guide foot was a great help in this - see it here, together with my jean-a-ma-jig - see it here. I'm having an awfully busy time at work and the heat wave (50 Celsius, 122F yesterday) is making me tired, irritable, unfocused and letargic :) Still, sewing relaxes me so much that I've tried sewing in small portions (like 1h30' every night) so I can still get something done. Those small portions are however difficult, because once I'm started, I get so involved in what I'm doing that I don't want to stop. Made from the denim that came from TimmelFabrics, using Hot Patterns Artful Dodger Slouchy Man Pants. I'm not sure I like them very much on me, but it's probably my fault too, I should try them on with a t-shirt and a belt and I might like them, but I was really very tired last night, plus I wanted you to see the waistband. 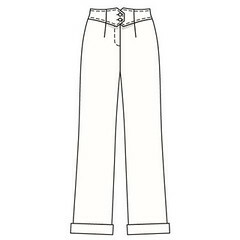 Slouchy-fit pants sit on the hips and have a classic waistband, with belt loops, front fly, and angled pockets. Pants feature front and back leg creases and turn-ups. Slinky Girl 6-14. I made size 6. Yes, with the modifications I made. See pants flat front and back. See back of the pants with me wearing them. I didn't follow the instructions, especially since I prefer to use Sandra Betzina's technique for a fly-front zipper - see a video of this technique, if you want, here. I like the classic shape of the pants, the wider leg (quite tendy right now), the turn-ups. The rise is a bit low however. First of all, I've raised the waist by 1.5 cm, the pants previously made from this pattern being a little low. I've also lowered the crotch for about 1 cm, change made at the last part of the crotch (the curved one that joins the inseam). Using my Denim Diva Pipe Jeans pattern, I made rounded jean pockets in the front, the yoke in the back and one jean pocket in the back (thought that one pocket might be funkier than two). See a detail iof the front pockets, fly and wastband here. See here a detail of the back yoke and pocket. I will definitely sew it again. As you can see, this is a very versatile pattern that one can easily change. The first version of this pattern is a black wool office pant that I like and wear a lot. Now, this second version is more casual, in denim and with a slouchy relaxed look. I'm already thinking of making another wool pair and possibly some in linen too. I think the wide leg would drape quite nicely in linen. Embroidered lace fabric and satin ribbon accentuating the empire line upgrade this romantic top into a trendy highlight. Aqua linen and pre-folded bias tape for binding the armholes and making the trim. As I made this top before and discovered it has quite some cleavage, I decided to add for this one 1.5 cm all around the neckline. Good decision, it fits beautifully and I like this wider shoulder, it covers my bra strap very well. I bound the armholes with pre-folded bias satin tape (I cut away the armhole seam allowances previously) and I used the same tape to embellish and make a trim for the underbust line of the top. I have used variegated metallic thread and a decorative stitch. Close-up of the binding and trim here. I used a stretch stitch to sew the trim in place, giving it a handpicked look. See this review for details. I will definitely sew it again, I like it very much, it is both trendy and feminine. Lined, above ankle, below mid-knee or mid-calf A-line skirt has side seam zipper. B: contrast overskirt. C, D: godet. E, F: flounce. I made view C but without the side godet. I made view C without the side godet and some modifications. 6-20. I made size 6. Well, I made quite significant changes, so I don't know how much it looks like the drawing on the pattern envelope. Very easy to follow and this is an easy skirt anyway. I've tried three different bias skirt patterns in the past two months and I think that this is my favorite. Why? It doesn't have darts (bias skirts made out of thin slippery fabrics fall better on the body if they don't have darts - well, this is what I've noticed). It doesn't have an elastic waist, but a "normal" waist and a zipper (I don't like elastic waists that much), it comes in two different widths, an almost straight skirt and a wider one. I still have to try the pattern in bias, I did two skirts and both were from very stretchy cotton batiste, cut on grain. Stretch cotton batiste, cotton satin and cotton/lycra knit. I ditched the side godet, added a wide (10 cm) cotton satin band at the hem and I did appliques on it, using the same flower template that I used for this jacket and this skirt, only this time I cut a hole in the middle of the flower, to change a little bit the template and not get very boring. Close-up of the applique. I've underlined the skirt using the same fabric. The underlining stops just before the band at the hem. The wide band at the hem was cut twice because I preferred to have a self facing instead of a hem, I wanted the skirt to have weight at the hem. Both the hem facing and the waist band are finished using this tip mentioned at the beginning of the review. Very helpful tip, even if it is for hems, believe me, it works wonders for facings and saving you time because you don't have any handsewing to do. See here how this hand picked stitch by machine looks on the right side of the fabric and click here to see how it looks on the wrong side. Pretty neat, huh? I added a 4 cm wide waistband, in the same cotton satin and finished it as mentioned above. The invisible zipper extends into the waistband - it is a treatment that I like and use all the time I decide to make a waistband. See a close-up here. I've used wash-away tape to make sure I match the seams - go here. My fabric didn't take serging well, no matter how much I played with the tension, the fabric was rolling into the serging, making a bulky finish. After trying for an hour, I've decided on a vintage seam finishing that Marji detailed in this review. See my seams here. They look pretty ok, even after washing, don't you think? The back of the skirt doesn't have any appliques, I was kind of tired after sewing the 5 flowers on the front, plus I think it makes an interesting contrast. See here the back of the skirt. I will definitely sew it again, next time I will cut this same wider version, but on the bias. . I am curious how it will drape on the body. I think I have real winner here and it could definitely be my favorite bias skirt pattern, that I will sew over and over again. I like to have some simple, well-fitting patterns and change them as I like. I think it is important: 1) to have a TNT pattern; 2) to have basic, classic and simple patterns that you can alter and embellish as you like. When I see a new style, a trendy cut, an interesting garment, I don't jump and buy the pattern, but first, I think what pattern in my stash I could change to do that garment. Think that all the more sophisticated garments start from a classic, simple shape, which is then manipulated and changed. My fabrics from TimmelFabrics, representing my 2nd prize for the 2007 SWAP are here! Aqua knit top using Butterick 4737 - I changed the sleeve to a dolman sleeve - see how I did it here. I used a home made trim again, this time by embellishing a piece of sheer organza ribbon. And used a triple stitch for the hem, as I was getting a bit tired of my twin needle topstitching. 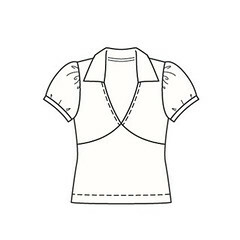 Close-fitting, pullover top has neckline and sleeve variations, purchased ribbon bows and trim. I made view C, but changed the way trim is applied and drafted a dolman sleeve. 6-20. I made a 6. It did, with the modifications mentioned above. I liked the wrap bust part and the underbust seam. it gives the top an Empire waist touch, plus the bust part is very flattering for my B cup. I took in the side seams for about 1 cm, I think the pattern is for moderate stretch knits and my fabric was quite stretchy. I changed the sleeve into a dolman sleeve (see my tip with photos on how I did that, if you would like details). I sewed staytape in the shoulder seam (which was longer after "merging" the sleeve and the bodice. I bound the neckline instead of sewing trim. I cut away the neckline seam allowance for that. 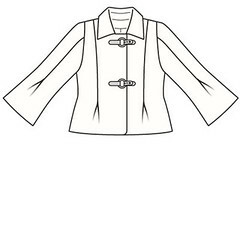 I first staystitched the front necklines and I crowded the back neckline (it was a bit large so I wanted to draw it in). I then sewed a piece of knit, about 3 cm wide, cut on grain to the neckline, stretching very gently, just a tiny bit to cup the neckline. Pressed the seam allowance, turned the knit tape under and sewed in the ditch using my stretch stitch (zigzag 1 mm wide 2.5 cm long). Pressed again and trimmed the tape. It is a non-bulky very clean way to bind your knits. I used a piece of sheer organza ribbon, embellished with a decorative stitch and sewn on the underbust seamline. See my tips on making your own trim and sewing non-stretch ribbon to stretch fabric, if you're interested. I was getting bored of my twin needle topstitching, therefore I decided to topstitch the hems (sleeves and bodice) using a triplestitch (it's a stretch stitch so it's ok) and I'm quite pleased with the result. I will definitely sew it again, I think it's my third top using this pattern and everytime I found something to change or to embellish. I like this type of versatile pattern, that you can embellish, morph and so on. And now... let's get to business and show you what I've sewed this past weekend. My husband is away to Lisbon on a business trip, so I got plenty of sewing time. However, things didn't work out very well. First, I wasn't really in a sewing mood (why does this happen when I do have time to sew and I'm alone so I can mess the entire apartment with fabric and threads???? ), and maybe that's why I was quite slow and did some mistakes - had to rip several times and start again. 34-42. I made a size 34 and it fits perfectly. I only checked the instructions to see how the trim is sewn and they were easy to understand. You sew a 5 cm wide knit band to the top neckline, then place the trim on it, with the lower part close to the seam you've just sewn. Then sew the upper part of the trim to the knit band, fold the band and sew the lower part of the trim, catching the band too in one seam. I liked the trim/ribbon added to the neckline and the racer back. I liked the contrast between the embelished neckline and the "sporty" back. None, except I made my own ribbon. I took a piece of double fold bias ribbon, fixed the folds on the back with steam a seam and embellished it with one of my decorative stitches and a variegated metallic thread that's been in my stash for years. The steam a seam also acted as a stabiliser. I used the same double fold tape to bind the armholes instead of sewing facings. Back of the double fold bias trim, to see how I folded it in place and used steam a seam inside to finished it and act as a stabiliser for the decorative stitch. Also, close up of the trim and the armholes binded with the same bias ribbon, only not embellished. I also did a wide hem, about 3.5 cm (I think you can see it in the picture of the top lying flat), I like those wide hems, they look really neat. I will sew it again, not only I like the details, but the top fits like a glove which is a first! Except my favorite Jalie wrap-over top, I have to take in quite a bit all the other knit tops patterns. Not this one! Also, I will use this type of decorated trim again, I'm already thinking of a lilac ribbon that I could use for an indigo skirt. I placed the bias tape on the skirt using steam a seam and then sewed it using my stretch stitch (a zigzag 1mm wide and 3.5 cm long) - it looks like a hand sewn catchstitch and I like it. The photo was taken before embellishing the ribbon. MISSES' SKIRT: Lined, above ankle, below mid-knee or mid-calf A-line skirt has side seam zipper. B: contrast overskirt. C, D: godet. E, F: flounce. I made view C but without the side godet. Yes, it did only without the side godet, of course. I've tried three different bias skirt patterns in the past two months and I think that this is my favorite. Why? It doesn't have darts (bias skirts made out of thin slippery fabrics fall better on the body if they don't have darts - well, this is what I've noticed). It doesn't have an elastic waist, but a "normal" waist and a zipper (I don't like elastic waists that much), it comes in two different widths, this view C that I made looks like a straight skirt and there is a wider, more flared version too - I will make that soon. Stretch cotton batiste. Very stretchy. Self-lined. Using a stretch fabric, I decided to cut it on grain, and not on the bias. It worked perfectly. I also wanted my skirt to have more "kick" therefore decided to bind the hem with assorted double fold bias tape. I've used the same bias tape (not folded) to embellish the skirt. I fixed it on the skirt, 8 cm above the hem, with steam a seam and then used my stretch stitch (zigzag 1 mm wide, 2.5 mm long) catching a fold of the ribbon and sewing on the skirt at the same time. I really like the effect, it looks like a hand sewn catchstitch. I then embellished the ribbon with one of my decorative stitches . I will definitely sew it again, probably next time I will do the more flared version. I am curious how it will drape on the body. Plus I really must try this pattern in bias too. I might have a real winner here and it could definitely be my favorite bias skirt pattern! Band sewn at the hem to give weight to the pants and make them hang nicely. Drafted to my husband's measurements apparently, but there were some problems. See below. Yes, it did, but only after altering the pattern. The instructions are a nightmare. Let me just give you a sample, this is how they instruct you to do welt pockets: "Make back slip pockets "in frame", with two facings. Fold facing right side out and press along the center. Pin facing (folded to different directions) on the garment right side along marking. Lay lining pocket bag on lower facing; lay fabric pocket bag on upper facing and stitch on 5 cm (2") distance along both sides of marking. Cut the fabric along the center between stitches, with small corner at stitch ends, then turn pocket bag into wrong side and make facings of 1 cm (3/8"). Topstitch facing free edges on pocket bag. Coincide both pocket bags, make them equal and stitch along the contour. Stitch facing ends on the fabric triangles on the wrong side. Tack pocket bag edges and waistline edge." I like that it is a classic pattern, but at the same time has some distinct features: the front pockets (kind of like jean pockets, but square instead of rounded), the wider straight leg. A mix of linen and copper (??) - at least that's what the label said, I never heard of copper but they assured me it's a natural fiber. Anyway, it's as wrinkly as a linen, but with a silkier finish and smoother. It looks very nice and it should drape quite well. I sewed these pants previously and discovered to my horror that the waist is really too low. My husband likes lower rise pants but still... these ones showed the elastic on his boxers for at least 2 cm! I think the pattern is wrongly generated by their CAD software, because the welt pockets were also placed to high, too close to the waistband. I therefore lengthened the upper part of the pants by 4 cm, while maintaining the same welt pocket placement. I sewed the welt pockets using Kathleen Fasanella's tutorial and paper jig - you can read it here and here. Next time I will try Debbie Cook's welt pocket tutorial (see it here). I like to experiment new techniques until I find the "perfect" one for me. The pants were not yet pressed when I took the pictures and the fabric is very prone to wrinkling, but I think you get the idea. Given this tendency to wrinkle, I underlined the pants with cotton batiste. I stopped just below the knee, I wanted to have the knee underlined in order to prevent knee deformation during wear but not wanted to line the entire pants. After all they are summer pants! Because my husband seems to appreciate the professional, RTW-copied details and I do too, I bound the pocket bags instead of serging them, using double folded cotton bias tape. I've sewn a special pants hem tape to the hem, to give the pants weight and keep them hanging nicely. What I do is press the hem in place, then sew the tape close to the fold, refold the hem and sew it by machine, using a blindstitch.